Did you know that an intact (un-spayed) female kitten can get pregnant up to three times per year? Each pregnancy could produce a litter of two to eight kitties. This means that just one female cat can produce between six and 24 kittens in a single year. Most of these kittens will be dumped or killed. Those who survive in the streets will reproduce when they hit puberty (at 5 or 6 months old) and the cycle begins anew. The solution to this problem is for responsible pet owners to spay or neuter their cats. And to curb population growth in your area, do a TNR project: Trap, Neuter, Return. 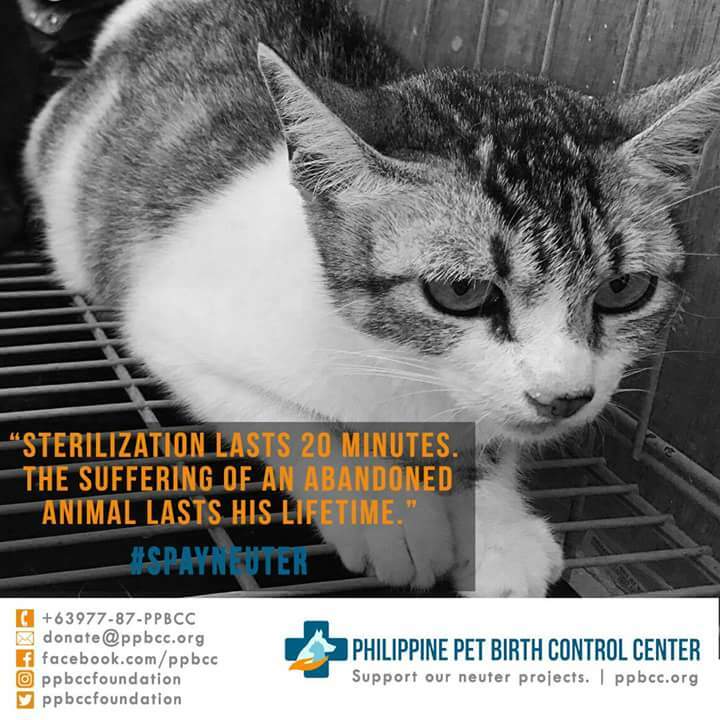 With your donation, you can help the Philippine Pet Birth Control Center Foundation do just that. Please click on the link below and help. Please check out their FB page for more details about their program. Thank you for promoting this, Steph! Thank you! The founder is a good friend and my cats’ vet. We need more people to be aware that this problem can be solved if we all help and do our part. We can end this and stop cats and dogs from suffering.